The Austin/Morris Freeway and Wolseley 24/80 were based on the A60 and Wolseley 15/60 that were designed in the UK. But due to the demand for cars with a 6-cylinder engine in Australia and with fierce competition from the Ford Falcon and Holden BMC Australia developed the Bluesteak engine. This was a 1622cc B-series engine with two extra cylinders added and developed 2433cc. The radiator was now moved forward so that it was bolted to the other side of the bonnet bridge and so the A60 was given a new radiator grille. The engine produced 80bhp and was coupled to a 3-speed gearbox with no synchromesh on first gear. In October 1964 the Wolseley was given a facelift and now resembled the 16/60 in the UK and the engine now produced 84bhp. 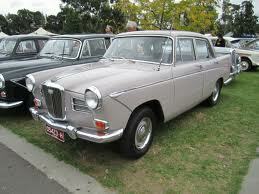 This was the last Wolseley model to be produced in Australia. Engine and Transmission: 2433cc B-series; 6-cylinder; 80 bhp (MK II 84 bhp) 3-speed gearbox with no synchromesh on first gear.